As the representative of the global Fashion Revolution community in Greece, Dr. Fiori Zafeiropoulou talked about the “stories behind fashion,” stressing the significance of transparency in clothing production conditions and mainly in working condition across multinational clothing industries, as well as whether fashion can have an environmental consciousness, commenting on the Greenwashing phenomenon and the trend of big companies seemingly adopting policies—for publicity purposes—that are advertised as friendly towards the environment, while their proper implementation is quite far from reality. 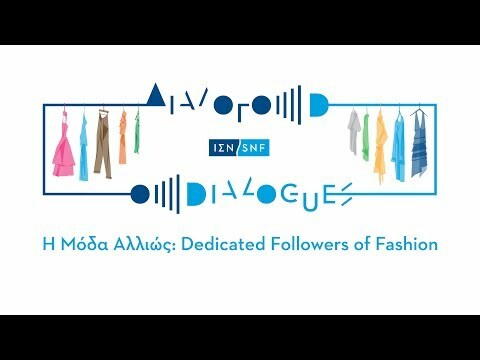 The fashion designer, Dimitris Petrou, referred to fashion as a “general idea” that concerns all of us, as well as to its multiple manifestations, and talked about the limitations imposed by the Greek fashion industry on the work of a designer, as well as the history acquired by handmade pieces of clothing. Journalist Effie Falida, mentioned, among others, the changing dynamics of fashion and clothing as “signs of the times,” reflecting social and cultural changes, while stressing the role of tradition and history in shaping modern trends, as well as the importance of craftsmanship which makes a return in the intercultural and economic reality of today’s fashion. Drawing from her own experience, blogger Nancy Spathi talked about the role and dynamics of fashion blogging, which, as she characteristically mentioned, has brought the world of fashion back to reality, making it more accessible and decipherable to the general public, calling everyone to become part of it. The next DIALOGUES will take place on May 23rd, 2018. More information will be available soon at www.SNF.org. Through the monthly series of live events, entitled DIALOGUES, the SNF presents, among others, individuals who inspire through their work and actions, and hopes to catalyze conversations around critical issues, around the world. DIALOGUES are open to the public. Participation is secured via electronic pre-registration, on a first-come-first-served basis. Furthermore, events are live streamed on the SNF website and are also available on demand in both video and podcast format on the SNF’s website.